When word came down that 60 Minutes would be shining a spotlight on Allegiant’s safety record a couple weeks back, I assumed I knew what it was about; I was just curious if we’d learn anything new. We did not. Instead we were treated to a really terrible piece of journalism. How awful was it? Pretty awful. If you watched the piece, you know that John Goglia was one of the primary experts used to prove that Allegiant is unsafe. But what 60 Minutes failed to disclose is that he’s an expert witness being paid to testify against Allegiant in a case that’s just about to begin, a case that was referenced in the piece itself. Not disclosing that is downright irresponsible, and it cast a shadow on everything else. After digging in, I realized that was just the most prominent of many problems in the report. This isn’t to say that Allegiant hasn’t deserved closer scrutiny. The idea that Allegiant was an unsafe airline was nothing new. There were the blockbuster reports from the Tampa Bay Times and Washington Post, but there had also been plenty of local and industry coverage surrounding individual events. If you asked most people in the airline industry, they had likely heard the narrative at some point. There are nagging questions, including extraordinarily severe incidents like the airplane that had a missing cotter pin. That should never have happened, and it resulted in a near-disaster. Everyone is lucky the pilots aborted that takeoff. There was a time, particularly in 2014 and 2015, where Allegiant saw its incident numbers spike. Even if it wasn’t the worst in the industry, as you’ll see below, it was certainly wise to look more closely at the airline back then. Allegiant also failed to do itself any favors in the way it handled 60 Minutes. It fought the release of FAA data. That made the airline look guilty. Then it failed to make its CEO available to go on camera. If you have scheduling conflicts, you move things around. As another industry communications pro said to me, if 60 Minutes calls, you don’t say no. And the memos with which the airline followed up were too little too late. Allegiant only made itself look guiltier through its actions, playing right into the flimsy 60 Minutes narrative. That narrative fed off the presumption of guilt at Allegiant, and then the story was manipulated to feed that conclusion. While there were some data points, 60 Minutes relied heavily on drama and fluff to hammer the case home. For example, Steve Croft noted in his intro that Allegiant “has more than its share of angry, traumatized passengers willing to share their experiences.” There is, of course, no way to verify whether Allegiant has had more than its share without asking every traveler if he or she has been traumatized. But 60 Minutes started with that questionable statement and rolled right into multiple segments showcasing passengers who had harrowing experiences on three separate flights. I’m not trying to belittle those people. I’m sure it was frightening to be onboard those airplanes, and I have little doubt all of us would have had similar responses. But that emotion doesn’t prove the thesis that Allegiant is more unsafe than the rest. Mechanical problems happen, and you can find people who have flown every airline who would gladly go on camera to tell their stories. But is Allegiant really worse? The program made a big deal about going to the FAA and making a Freedom of Information Request to get Mechanical Interruption Summary Report (MISR) data. (Allegiant objected, as noted, but the data was eventually released anyway, as it should have been.) But 60 Minutes noted that it requested information from Allegiant and 7 other airlines. Why when crafting this 3.5x stat did Allegiant only get compared to five of those airlines? Also, how did 60 Minutes sift through this data? I’m told some airlines file MISRs only for the minimum events required while others may file MISRs for every little thing. I reached out to 60 Minutes and asked a question about methodology, but I did not receive a response. The irony of this, considering how 60 Minutes skewered Allegiant for not putting someone on camera, was not lost on me. I don’t have the MISRs, but I do have access to Service Difficulty Reports (SDRs). When aircraft run into even minor problems, SDRs are filed with the FAA. This data is publicly available online. 60 Minutes looked at the data between January 1, 2016 and October 31, 2017 and said it found 100 “serious mechanical incidents” for Allegiant. Even though 60 Minutes never responded to my query about methodology, I can get in the general neighborhood, so I don’t question the accuracy of these numbers. What I DO question is whether this is abnormal or not. 60 Minutes chose John Goglia, a former National Transportation Safety Board (NTSB) member who uses the Twitter handle @crashdetective, as one of its main experts to show just how awful these statistics were. John claimed that the number of events was “very, very high for an airline of this size.” He had plenty of other jabs to throw, but they just don’t hold up. In a well-researched piece, Courtney Miller debunked the claims that Allegiant’s SDR rates were significantly higher than others. His story, Is Allegiant a Safe Airline? – Using Data to Review 60 Minutes’ Conclusions, is a must-read. What you find is that 60 Minutes manipulated the data, hand-picking the airlines to include in its dataset to make Allegiant look worse than it is. If anything, that chart shows that if Allegiant had a problem, if there was a story to be told, it’s at least a couple years old. The program admitted it had been working on this for some time, but it was still late to the party. I’ve heard people say that 60 Minutes has been sniffing around for several months, but that would mean that the numbers had started to come down long before 60 Minutes started knocking on doors. So why did 60 Minutes run this now? There does seem to be something that ties this all together, and if this is true, it puts 60 Minutes into an even worse light. It goes back to John Goglia, Jason Kinzer, and Allegiant flight 864. If the data doesn’t support the conclusion (or, at worst, hasn’t for a couple years), then why would John Goglia, someone with lengthy (if not recent) experience with accident investigations, go on camera and mislead? Well, we don’t know, but we do know that he had good reason to do so. One of the flights that the report covered was Allegiant 864. It had a burning smell in the cabin after departing St Pete, so it returned to the field and evacuated. The pilot was fired after the investigation was completed, and he is suing the airline. It’s in this case where John Goglia is a paid expert witness for the pilot, testifying against Allegiant. That doesn’t mean 60 Minutes couldn’t use him in the piece, but it had an obligation to disclose that relationship. The firing of Jason Kinzer, the captain of Allegiant 864, was used in the report as a way to demonstrate a problematic culture where people were fired for putting saving lives over saving money. That is certainly the story being pushed by the pilot, but Allegiant has a different take that deserves to be heard. In other words, the FSRB found issues with how he responded after the incident. In any incident or accident, you want to learn from your mistakes, because you never do everything perfectly. In this incident, there were several issues. For example, the captain did not put on his oxygen mask even though that’s standard procedure in a situation like this. He also evacuated people through an exit right in front of the engine that he supposedly had concerns about. But according to Allegiant’s filing, the captain wasn’t interested in learning and said he “saw no room for improvement.” All of that is why Allegiant says he was fired. Whether that’s correct or not is for the court to decide when the case picks back up here shortly. It’s clear that 60 Minutes wasn’t interested in waiting for the court, however, because it simply presented the one side that pushed its narrative forward. I couldn’t imagine that one case could drive the viability of this whole story, but maybe I should rethink that. Remember how the timing seemed strange? Well, this just happens to have run right before the court takes up the case. Strange timing indeed. Alarm bells rang for me once again when Teamsters 1224 President Daniel Wells (who doesn’t fly for Allegiant, but his union represents the company’s pilots) came on camera. It’s not that his speaking was of concern. It’s the fact that no Allegiant pilot spoke. Daniel brushed this off, saying that nobody would talk because the company wouldn’t let them, as if that’s not the normal media policy for every company. But 60 Minutes can blur faces, change voices, or just print anonymous statements. If these issues are as severe and as compromising of safety as the story suggests, then 60 Minutes shouldn’t have had a problem finding at least one pilot who was willing to stand up and be a whistleblower. Instead, they let a union rep just spew out hearsay of generalizations he says he’s heard from other pilots. That’s rather weak. None of this smells right. There was a chunk of the report that talked about Allegiant 864, and John Goglia, a paid expert witness for the pilot of that flight, was one of the two primary experts used to validate the findings. That alone is highly concerning. The timing makes things even worse. You have a letter from the pilot’s attorney saying that if Allegiant settles, the media scrutiny goes away. Allegiant didn’t settle, and this story comes out right before the case goes to trial. Like I said, none of this smells right. I grew up watching 60 Minutes and have long enjoyed many of their exposés. But seeing how this was handled raises serious questions for me, and it’ll make me think twice before blindly trusting anything else they put out. Cranky: Your check from Allegiant is in the mail. Any of the ‘down-voters’ considered William was (possibly) trying to ‘make a funny’? Or don’t we do sense of humours below the line on CrankyFlier? Excellent analysis. Thank you for your service. So… you’re saying a news organization would actually mislead its viewers? If you’re talking about Fox News, then yes. While 60 Minutes’ piece was less then perfect, and had a lot to be desired in terms of attributing other sources, it did expose Allegiant for what it is: an airline with a shoddy safety record. Don’t say 60 Minutes misleads; if anything, this story should be a warning to any airline that thinks it’s o.k. not to talk to the press. Yeah, OK. Try those shoes on. Very well said. The root of the problem is that the media has come to see itself as the arbiter of truth in many aspects of life, believing that they have all of the facts to make an accurate assessment of reality. In fact, aviation safety is a highly complex and technically detailed undertaking that must be done by experienced, impartial professionals that have nothing financial to gain from the truth. ALGT’s problems have been known for a long time and the FAA has increased oversight of the company but the press and the rest of us have to believe that the FAA is doing a better job than any of the rest of us can do with the facts it, not us, have. OTOH, ALGT’s problems of a few years ago show that when a company compromises its safety culture, getting rid of the stigma associated with any negative public event can take years if not longer. Add in labor problems and ALGT has a major PR issue that it has to overcome. The real measure of whether CBS succeeded will become known over the coming months as it reports its finances. If ALGT is financially harmed by incorrect facts, they should sue CBS. The media has paid dearly for slandering companies and products using inaccurate information. However, if ALGT thinks they can overcome the bad press and it doesn’t harm their business, then the best course of action might be to just ignore CBS, esp. given that there is an element of truth in what they said, even if facts were taken out of context and data was manipulated. I stopped believing 60 Minutes in 1986 when they absurdly claimed that the Audi 5000 could accelerate furiously while the driver was pressing the brake pedal to the floor. Anyone who knows about cars knows that the brakes are stronger than the engine. Drivers were obviously flooring the gas not the brakes. Audi’s reputation was destroyed by 60 Minutes’ manipulation and lies. The show is tabloid TV. Main stream media does a story where it doesn’t disclose possible conflicts of interest or possible bias. In other news, “Dog Bites Man. “. Thanks Brett for the rebuke! Makes me worried less about a flight I have on Allegiant next month. Still not happy that the plane was just switched from a newer A319 to an older MD-80. A pilot friend over the years has said Allegiants MD-80s should be avoided, though now that I think of it from your data it was during the time when they saw the spike in safety issues. That big chart should have each curve labelled on it, or else should be color coded with a legend. I personally believe the spike in their “incidents” during the time period involved labor relations. The company and pilots were at war over a contract. So the pilots did, what they could do and it worked. They would cancel the flight or return/divert for something that in most other instances would have been a discretionary matter and continued flying. But it had the desired effect I think some management changes happened and they also got their contract. Mysteriously the events decreased. Granted their aging Mad Dogs we beginning to retire as they grew their Airbus fleet. So that helps. When 60 Minutes announced their expose my first thought was “aren’t they a little late to the party?” The Tampa Bay Times did an article a year or two back that closely examined Allegiant. That was timely and relatively accurate. As to why the plaintiffs attorney would e v e r put into writing those words basically saying settle and this all goes away is absurd. If I were the judge I would dismiss with prejudice. Allegiant isn’t perfect, I’ve never flown them. But my parents love them. They fly them several times a year and often it’s the same crew. They treat them well, take good care of them and have never felt underserved. Oh and PS they had a diversion once because their home airport RFD so off to MKE they went. No nail biter their. But I suppose they could have went on social media about the decision to cancel descent and climb and turn to head to MKE. Perhaps my mom sitting in her wheelchair with tears streaming down her face would have earned her a viral sensation at the time. If the plaintiff indeed “feel he had nothing to learn” as a result of Flight 864 he was either a Sky God or just stupid. Whether you are a doctor, pilot, police officer or anything in between, there is always something you can learn. Every single time. Anyone who says otherwise is a liar and for that he deserved IMHO to have his relationship with Allegiant terminated. Shame on 60 Minutes for not disclosing the various relationships. That is deeply disappointing because I have always considered them relatively honorable. Of course I do agree they have had a few head scratchers in the past. I wonder if 3 years from now WN will be in their crosshairs. Sorry typo…h and PS they had a diversion once because their home airport RFD so FOGGED IN OFF to MKE they went. Great insights and thoughtful analysis, Brett. I’ve been following this closely; interesting from many angles to say the least. This airline dork and crisis communication nerd certainly learned a thing or two here. And definitely agree that Allegiant did itself no favors by not making its CEO or at the very least a corporate spokesperson, available to go on-camera. Very well said. Alas, many of the people who-quite rightly-will dump on “60 Minutes” for this will go on believing the swill that flows so freely from the likes of Sean Hannity and the other puppets over at Fox. As an unrelated note, Allegiant once stole one of my friend’s photos off of airliners.net, and when my friend contacted them, the response was totally unprofessional. I’ll have nothing to do with them, 60 Minutes or no 60 Minutes. Well done Cranky – excellent rundown – thank you. While I had also read Courtney’s excellent synopsis, I also tripped over another controversial article on Mr Goglia. 60 Minutes is a very old show who’s audience is mostly baby boomers who grew up with it during a time when news was reported and not make up, altered or sensationalized for rating. Now with an older audience fading away, it must join the tabloid news mind set to grab younger viewers and ratings. Anyone know when the Cher dates space alien that looks like Sonny segment airs? 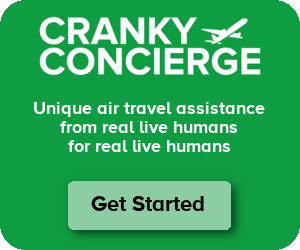 Hi Cranky – long time reader, first time poster. Great commentary – as usual. I’m a fellow travel agent and airline geek – nice job. And I fly G4 every 3 or 4 months. Enough with the bashing of 60 Minutes people! Did you happen to watch last night’s show on gene medicine and college scholarships for poor and disadvantaged high schoolers? That was a great show. Don’t call it tabloid TV and misleading! At least 60 Minutes exposed Allegiant Airlines for what it is, a trash airline. Would any of you fly with Allegiant? Nah, I didn’t think so. ANYONE who bashes news or reporting as fake, only disagrees with what’s being reported on, or finds objection to it. That’s it. Wasting your time. As someone wiser than me once said, “never read the comments.” There are times I agree with Cranky, and times I strongly disagree. He’s not infallible. But, this piece is nuanced and interesting, and it deserves my attention to read it through three or four times. I appreciate the depth of his analysis here. But if you’re counting on the maudlin industry sycophants that infest Cranky’s comments to have any self-awareness at all and to understand anything beyond the headline, you’re fooling yourself. Cranky: Thanks for the solid journalism and balance in your analysis. Steve Croft and the other narrative pushers at 60 Minutes would do well to read it. Compliments on a strong piece of journalism. I’m usually pretty skeptical about corporate behavior under fire, but after reading this, I’m starting to wonder who’s doing what to whom. Great write up Cranky. I watched it for about 5 minutes and realized it was nothing more than a hit piece and shut it off. Did you reach out to me or my team for this article? If not, isn’t that what you’re challenge CBS over; promoting their narrative? I wanted to believe that your objective here was to do away with innuendo- now I’m not so sure. Jason Kinzer – [FYI, this is the captain of Allegiant 864, or at least someone using his name, for others reading the comments] I think your side of the story has been told quite extensively in the media and through your social media postings, including in the 60 Minutes piece itself. As I said in this post, I’m not looking to decide who is right and who is wrong. That’s for the courts to decide. But short of a court decision, 60 Minutes shouldn’t be presenting only one side of a case. I’m not interested in placing blame in your particular case, but if you or someone on your team wants to provide me with information, you’re always welcome to contact me at cf@crankyflier.com. I found it interesting that they interviewed retired FAA attorney Loretta Alkalay. She ran the Northeast Region General Counsel’s office, and she retired in 2009. So what knowledge of Allegiant did she bring to the report? The FAA has undergone several changes in its certification and oversight processes and has implemented various programs that provide for robust surveillance since Ms. Alkalay retired. I thought that Ms. Alkalay, like John Goglia, brought nothing timely to the report since she’s been away for 9 years, and I wondered what her ulterior motive was (is she also a paid expert witness against Allegiant?) or why it appeared that she had a vendetta against the agency for which she worked for 30 years. Also, I remember the labour disputes at Allegiant and how poorly both sides behaved, as reported in industry blogs. Allegiant Air had been in unsuccessful talks with its pilots for years. In July 2016, 86% of Allegiant pilots voted to ratify a very substantial contract, which offered pilots a pay hike of up to 31 percent, paid vacation of up to four weeks, an improved scheduling system, and a massive increase jump in the company’s 401(k) contributions.In the previous year, Allegiant pilots threatened to strike but were blocked by US courts. You can’t tell me that contract negotiations had nothing to do with the increase in SDRs/ASRS reports. TRB – I have a hard time tying this to labor action. Courtney’s post and presumably 60 Minutes as well only looked at serious incidents, things like engine failures and emergency landings. While I don’t doubt there could have been labor actions on smaller issues, I think (and hope) that this would be pushing too far for any kind of labor action to fake something severe like this. Great review of the 60 minutes story on Allegiant. Did you notice that the compass rose behind Steve Croft went to 370 degrees, not 360? Do you think that was intentional or just ignorance from the graphics department? Catherine – A friend pointed that out to me. There’s no way that’s on purpose. That just looks like sloppy graphic artist who don’t know how directions work. In other words, 60 minutes just pulled a Hannity. Hannity provides entertainment and opinion, not news. 60 Minutes pretends to be a news program. That being said, the 60 Minutes piece is not surprising. There are very few news organizations who can cover an aviation story involving and incident or accident without sensationalizing it. Several yeas ago, I believe it was 60 Minutes, that trotted out a lady with several medical issues. She had her dental amalgams removed from her teeth because of the mercury content. Amazingly, the medical problems disappeared immediately, though mercury in the body would take a long time to be released. It turns out that if you remove dental amalgam, more mercury will be released than if left filling the cavities in your teeth. Another example of sloppy reporting. With all do respect, you have not made one single valid to convince me that 60 Minutes Allegiant Story is questionable. The fact that John Goglia is being paid for his testimony in the Kinzer court case is in fact very normal. Witness are always paid to appear in court, right down to police officers, doctors, and any other person relevant to the case. So that has no bearing at all as to the credibility of Mr. Goglia or his statements and testimony. As far as the letter of explanation why Captain Kinzer was terminated is nothing less then absurd. If there was anyone that should of learned anything from the incident it should of been the airline, not the captain. As a matter of fact that letter is prove in itself that Allegiant is trying to shift blame. If there was in fact a attitude or behavioral concern with Kinzer why wasnt this noted during his initial hire, flight training, while flying as a second officer, during his upgrade evaluation, during his prior line checks, or at his recurrent check rides ? Judging from the information I have I can tell you that I would of done the exact same thing Captain Kinzer did, regardless of what airline i worked at and regardless of what type of aircraft I was flying. As far as the maintenance and vast amount of emergency returns reported there is no doubt that there is a serious problem. For fleet size and number of flights conducted by Allegiant there is a unusual high number of incomplete flights, emergency returns and incidents. Here is what really got me about your letter, you think it is odd and questionable that no Allegiant pilots were on the 60 minute show. Surely you can’t be that naive to think that after what happened to Kinzer any other fool would go and make any waives for themselves. You should really think before making stupid remarks like such. Lastly the letter the attorney wrote to Allegiant. Well although you may take it as a threat I look at it as negotiating. For any attorney a victory without having to step a foot into court is twice as sweet as a verdict. Fly safe !! Ladies and Gentlemen of the Jury….have you reached a verdict? If the jury rules against Allegiant, will they have the integrity to admit they were wrong?